There is clearly controversy surrounding the origin of autism. Some researchers, such as the UK’s Dr Andrew Wakefield, a team in Utah, and another in Dublin, feel that vaccines, and particularly the MMR vaccine, can cause this condition. It has also been pointed out that Amish children, who are not usually vaccinated, do not share the same level of autism (if any) as children who are routinely vaccinated. The question is … can dogs be autistic? Just over six years ago, my husband Rob and I decided to adopt a rescue Papillon. We had come into contact with this wonderful breed when a Papillon fancier organised a workshop for me, and there were several Papillons in the audience. We were greatly impressed with their intelligence and beauty. Well, who would fail to be attracted by such a proposition? The rescue coordinator went on to say that this little chap didn’t like men, and that he was prone to biting. He was five years old and was being rehomed because his elderly ‘mum’ had died, and her husband didn’t want to keep him. Rob and I felt fairly confident that we could help Georgie, mainly because Rob – a man – is very calm and gentle and has qualifications in canine psychology. However, when we collected Georgie, he had to be herded into a crate as if he were a wild animal. At one point, he got himself between my feet and started to spin in a circle whilst snarling and attacking himself. We were advised to drive the 200 or so miles home without letting him out of the crate, lest we couldn’t get him back in again. Once home, Edward, my late beautiful old Golden Retriever, was delighted to meet Georgie and took no notice when he was triggered into a spin. Georgie also seemed comfortable with Edward. We soon learnt that Georgie wouldn’t allow us to touch him. We also learnt that he favoured the freeze part of the flight, fight or freeze stress response. This meant that the tiny little dog, who wasn’t always easy to spot underfoot, didn’t get out of the way of moving feet or clumsy puppies. His second stress response was fight – which meant that if you accidentally walked near him or brushed into him, he would bite your feet. Luckily, being such a small little man, and providing you had shoes or slippers on, his teeth couldn’t cause much damage. The puppies soon learnt to respect his space. A little research revealed that there is a form of epilepsy in dogs which involves spinning. Called ‘complex partial seizure’, it can be difficult to recognise but includes lip snapping, snapping the air, aggression, spinning, and obsessive behaviour. Georgie also fixates on flies, bird song, and light reflections, and sometimes he will obsessively lick the carpet for hours (unless we give him a homoeopathic remedy which stops this). How do you walk a dog who won’t allow you to touch him? How do you get a lead on and off if he attacks you or himself if you try? How do you ensure that he’s in good health? How do you inspect his teeth or his ears? How do you groom him? How do you get the grass burrs and knots out of his coat? What do you do if he growls at you every time you look at him? I telephoned a long-time friend who is a gifted medical intuitive. “He’s vaccine damaged,” was her immediate response. “He won’t let you touch him because it’s as though he hallucinates when hands go near him. It’s like epilepsy.” She suggested a number of homoeopathic remedies for us to try – all for the unwanted effects of vaccines. Sometimes it’s difficult to know which came first – the chicken or the egg. This is so with Georgie. I feel sure that some of his problems come from unsympathetic handling in the past. For example, if I walk into a room with a piece of kitchen tissue, Georgie looks frightened and growls at me. He sometimes has difficulty with his poo – it will stick to the feathers on his beautiful bottom, and sometimes it will drop off in the house. Maybe he was punished for this in the past? He also arrived elegantly groomed, and the only way this could have happened would have been if he had been forced. We know how distressed he gets if we touch him. It’s beyond dislike. Georgie became nearly hysterical when we tried to groom him – so we have decided that we will not force him. To get an official diagnosis of epilepsy, a vet will need to check for thyroid disease, liver problems, metabolic disorders, central nervous system damage, infections, and genetic disorders. If results indicate problems, other tests might include an EEG, a CT scan, an MRI, and a cerebral spinal fluid test. Bearing in mind there is no cure, and bearing in mind that we don’t like putting our dogs through aggressive procedures or administering aggressive drugs, we weren’t in the market for all of these. 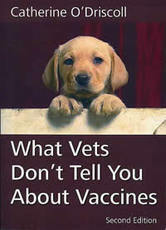 Endorsement of our view came from another route when we were introduced to Dieter Harsch and Iris Parizek in Germany who run a Canine Health Concern equivalent over there. Dieter is a skilled Bioenergetic therapist. He offered to take a look at Georgie’s hair sample for us – and came back with the diagnosis of vaccine damage (which a conventional vet, despite all of his expensive tests, would not do). Dieter sent some more homoeopathic remedies to treat vaccine damage. Alongside this, Rob worked to slowly and gently try to desensitise Georgie to touch. Very, very slowly and gradually, he has been getting Georgie used to being stroked and very lightly brushed. Some days are better than others: there have been days when we have both cried because Georgie has responded with utter joy at being touched. Other days are not so good, and Rob has to stop trying as it distresses Georgie so much. However, this has never happened without food. Without titbits, Georgie will not come near us – although he cracks our hearts open every time we arrive home and he greets us. He comes running up to our lowered hands and kisses us before running away. We have adopted a non-confrontational approach with this little man – and thank goodness he isn’t a large dog or this option just wouldn’t exist. He would have been called a dangerous dog and euthanised. There have been times, especially in the early days, when Rob and I were heavy-hearted, wondering why we had allowed ourselves to be ‘suckered’ into taking Georgie on. Yet now we just adore him. Small improvements are big events in our house. And he is such a loving, loyal little dog. Sometimes I see him looking at me and I know he longs to be cuddled, but he understands that he’s not like other dogs, and that he can’t be. However, being himself is more than enough. When I broke my leg at the beginning of the year, it was Georgie who insisted upon looking after me and sleeping with me in my downstairs isolation. It’s Georgie who wants to ensure we are all together. And it’s Georgie who has charmed his way into our hearts. Temple Grandin is a famous person with autism who has written a number of books, including ‘Animals in Translation’ ‘Thinking in Pictures’, and ‘Emergence’. Her main contribution has been the invention of devices that eliminate some of the cruelty to animals in slaughterhouses. We asked the rescue coordinator to make enquiries about Georgie. Had he been vaccinated every year? His previous owner replied that, yes, he had – and that his behaviour got worse every year (although they didn’t know he was vaccine damaged. They just thought he was a naughty boy). This tiny little toy dog received the same dose of vaccine every year as a Great Dane or Pyrenean Mountain Dog. More recently, Georgie has been given CBD oil and we find him more amenable to being touched. He is also far less reactive, and calmer. See http://chcstore.weebly.com/cbd-oil.html CBD oil is currently being used as a treatment for children with epilepsy and other forms of vaccine damage. a. Antibodies to myelin basic protein in children with autistic behavior. Singh VK, Warren RP, Odell JD, Warren WL, Cole P. Brain Behav Immun. 1993 Mar;7(1):97-103. b. Serum anti-myelin-associated glycoprotein antibodies in Egyptian autistic children. Mostafa GA, El-Sayed ZA, El-Aziz MM, El-Sayed MF. J Child Neurol. 2008 Dec;23(12):1413-8. c. Abnormal immune response to brain tissue antigen in the syndrome of autism. Weizman A, Weizman R, Szekely GA, Wijsenbeek H, Livni E. Am J Psychiatry. 1982 Nov;139(11):1462-5.